KGK Group in its drive to nurture constant growth attains yet another milestone by purchasing a stake in Unique Settings New York. 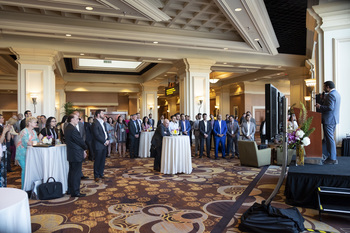 At JCK Las Vegas Show 2018, KGK and Unique Settings announced their collaboration that aims at optimally serving their patrons with a wider range of services. KGK has emerged as one of the few conglomerates that cover the entire spectrum of mining, sourcing, manufacturing and distributing coloured stones, diamonds and jewelry for over a century, and has achieved the vertically integrated standing of mines-to-brands in gems & jewelry realm. While Unique settings whose facility is based in the heart of New York was amongst the first one to pioneer just in time concept and is today armed with a workforce of about 200 employees, offering a spectrum of services with an efficiency to deliver a tailored product in 5-7 business days. Complete product is manufactured from start to finish in the USA and becoming a one-stop shop solution for the retail industry, Its expertise range from a large collection of Bridal Jewelry and Wedding bands to a dynamic, yet flexible product line to offering the independent jeweler a vast number of services to customize any piece of jewelry. Services, which include making changes to existing pieces of jewelry in the collection, or the creation of a new one-of-kind design created from a sketch. Considering the unique strengths including experience and resources of both KGK and Unique Settings, the unification of the two far-reaching corporations will definitely revolutionize the industry by extending the best and the most competent offerings like never before. In addition, this partnership will certainly advantage the diamond, gems & jewelry industry at large.